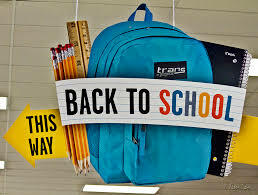 I cannot believe it is already time for back to school shopping! School will be starting before we know it! You will be receiving a back to school letter in the mail sometime in the next few weeks, but I figured some of you may be curious about the items you will need now. The second grade teachers supply everything that your child will need. I have purchased a pencil pouch for each student and already filled it with 2 pencils, crayons, a glue stick, an eraser, a whiteboard marker and eraser, and a bookmark. We will supply all of the folders that your child will need. -Earbuds- Each child will have a Chromebook that they will use daily. We recommend sending in a pair of earbuds that your child can use. If they do not have earbuds, they will use the school’s headphones. Your child can store his/her earbuds in his/her pencil pouch. Please click here to complete the survey before the start of school. Thank you for your time! Feel free to send me an email or leave a comment if you have any questions! I cannot wait to partner with you and your family this year!